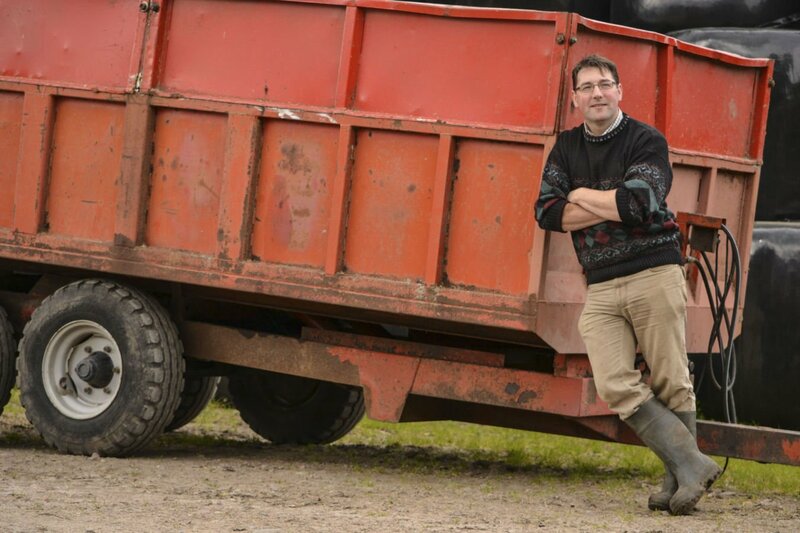 Hi, and welcome to the Rothiemurchus Farm blog. First of all, I’d better introduce myself. My name is Alan Rankin and I’m the Cattle Manager. I’ve only been here 6 months, following in the footsteps (or should that be wheel tracks?) of Sandy McKenzie, who retired after nearly 40 years at Rothiemurchus. No pressure, then……. Since starting at the beginning of January, I’ve had quite a steep learning curve. I was born and brought up on a livestock farm and I have worked in agriculture all my life (apart from four days at university and six weeks operating a sewing machine. Don’t ask……..), so the farming side of things isn’t a problem as such, however Rothiemurchus isn’t like any other farm I’ve worked on!!! Because the farm is just one of a number of enterprises here, I have to take them into consideration when making decisions. In a typical week, I’ll have discussions with Johnnie (my boss), Euan and the maintenance team, Julian and the Ranger team, Jamie the butcher, Feona at the pony-trekking, Mike at the Quad Bike Treks, Chris at the Off-road Segways and many more besides that. It’s fair to say my people skills have sharpened up in the last few months (Kevin, the farm assistant, may dispute this!). 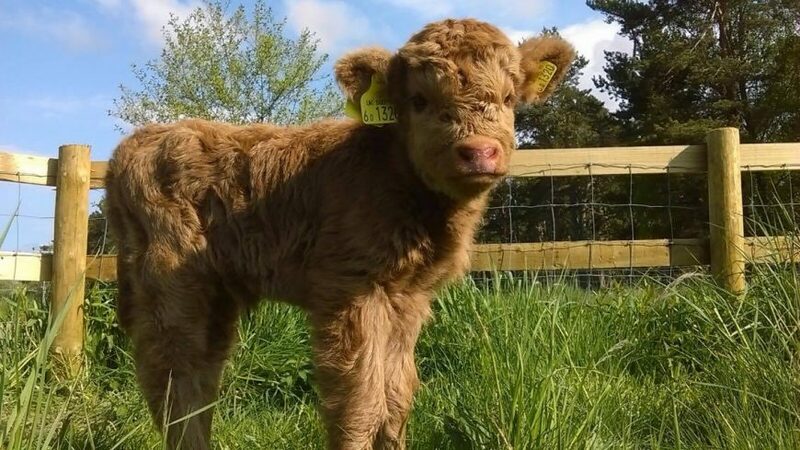 This is ‘Rosie’, one of our Highland calves. I had a few weeks to find my bearings and get to know the place before the non-stop madness known as calving time started. We run two separate herds, a pedigree herd of Highland Cattle (the hairy, horned ones) and a crossbreed herd (not so hairy, hornless ones) both of which calve from the middle of March onwards. At the time of writing, we’re still waiting on 3 out of a total of 93 to give birth. The old farming saying “When you keep livestock, you’ll have dead stock” is, unfortunately, true but we’re thankful that despite some terrible weather at times we’ve kept losses to a minimum. We calve all our cows outside at Rothiemurchus, whereas many farms house cattle to calve them. Obviously, the weather becomes less of an issue but disease such as pneumonia can spread like wildfire in cattle sheds, so on balance, we think it’s a more natural, healthier environment to have them calve outside in fields that have natural shelter from all but the worst weather. It’s better for the beast but a bit more work for the man. Luckily, I’m backed up by Kevin Ross who goes above and beyond the call of duty, all of which has made it a successful calving season. During all of this, we still find time to sow our spring barley. While other farms often get fields ploughed through the winter, we like to leave our fields as late as possible before ploughing to benefit ground nesting birds. It adds a bit to our workload at an already busy time but the bigger picture is we have to farm in tandem with Mother Nature, not to her detriment. She’ll be about a long time after I’ve finished farming…… Hopefully, the barley will yield well come September and the prices make it an option to sell for distilling malt whisky but if that’s not the case, we’ll keep it and mill it for cattle feed next winter. 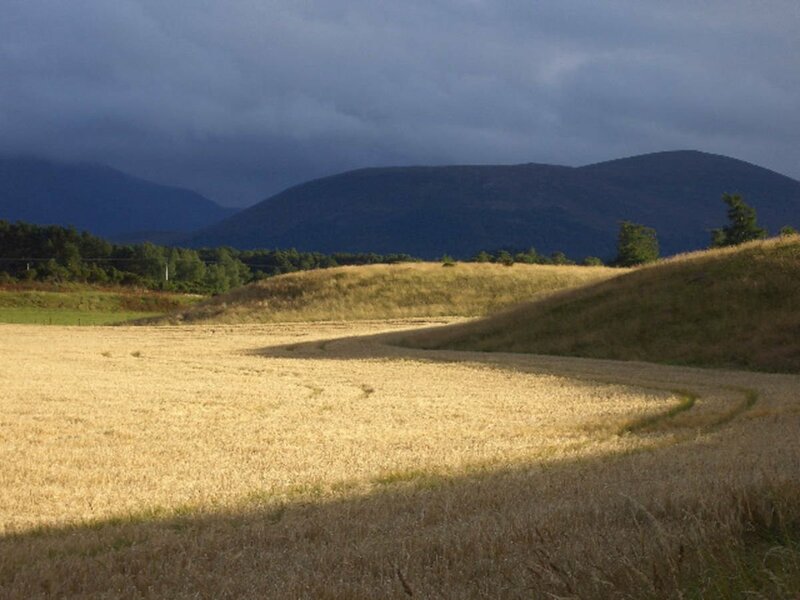 Could this be Scotland’s most scenic barley field? The latest job completed is silage making. For speed, we use a contractor. More than 50% of our winter feed is cut, chopped and ensiled in just over 24 hours – it was a pretty full-on day but it makes for top quality forage. I hope the cattle appreciate the efforts we go to!!! The Scottish weather provided it’s usual unique challenge, but the grass is in the pit and the pit is covered. I even managed a smile! Alan, after a hard day’s work filling the silage pit! Hopefully this has given you a bit of a flavour of the farm here at Rothiemurchus, I look forward to giving you more insights to farm in future blogs. Leave a comment if you have any questions about the farm and I’ll try my best to answer them.